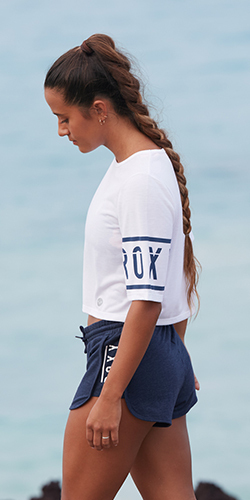 Global fashion and action sports apparel brand ROXY proudly invites girls to let the sea set them free and have the opportunity to live the dream of a ROXY girl. ROXY’s “Let the Sea Set You Free” contest is a global social media initiative that embraces digital and multi media platforms. Girls over the age of 18 will be able to submit videos, photos and essays that creatively demonstrate why they embody the ROXY spirit and what makes them the right choice to experience a life-changing adventure. The contest launches today February 24, 2012 at the Roxy Beach Tent at the Roxy Pro Gold Coast at Snapper Rocks, QLD, Australia from 10am. All girls are welcome to enter the tent to sit back and watch the surfing, hang out with our Roxy Girls including Sally Fitzgibbons, Lisa Andersen, Philippa Anderson, Kelia Moniz and Monyca Byrne-Wickey, get their nails done at the Beach Toes Nail bar, read the latest Cosmopolitan, get styled in the latest Roxy product, get their photo taken and sent to their Facebook account, and most of all find out how they can maximize their chances of winning the contest. Submissions will be accepted through April 8, 2012. The public will vote for their favorite girls. The top 75 finalists globally, determined by fans and a select ROXY panel of judges, will then be challenged to create a one minute video that explains how the sea sets them free using music and imagery provided by ROXY. On June 15, one winner per region from the Americas, Europe and Asia-Pacific regions will be announced. Three girls will win a life-changing adventure which includes a trip to Biarritz, France for the Roxy Pro surf competition in July, the opportunity to learn to surf the best waves in the world, a chance to meet the ROXY pro athletes, up to $5,000 USD, and a second surprise adventure trip. The winners will also host ROXY video segments as a face and voice for the brand and experience life the way the Roxy girls do. For more information and to enter visit the ROXY Facebook page at facebook.com/roxy or the “Let the Sea Set You Free” contest site at roxyaustralia.com.au/seaforyourself.